Year after year, fans of the beautiful game are subjected to — or rather, subject themselves to — the debate over which league is the best in the world. with so many top class strikers in the premier league, it HAS to be the best league in the world… right? In general, it’s a pretty fruitless argument. There are like a billion ways to define “best”: most number of top teams, the league with the most parity, the league with most top players, the richest league, the most financially sound league, the most entertaining league, the most successful league, the most popular league, and the list goes on and on. And even if you were to average up all of those different factors, half of those are still clearly based on opinion. So why even bother? Well, because we’re pretty self-centered species that’s naturally driven to prove to the rest of our peers that our opinions are the right ones so we can feel smug about ourselves. Therefore, the debate will rage on until there’s only a single league to watch. Which will be never. Regardless, the leagues that are mentioned in this discussion have remained fairly constant: England’s Britain’s Premier League, Germany’s Bundesliga, Italy’s Serie A and Spain’s La Liga. Each has had its time in the sun as the consensus “world’s best league”: Serie A held the title for much of the 90’s and was supplanted in the early 00’s by the Premier League. And of late, La Liga and the Bundesliga have made headway in the court of public opinion. For some reason, this flux in opinion grates the hell out of people. Fans of the Premier League in particular tend to lose their minds whenever it’s suggested that the Premiership has lost some of its luster. How dare you criticize “the Prem”? You are aware that Arsenal/Liverpool/Manchester United/Chelsea is the most popular team in the world, right?! That’s why everyone wants to play there, you know! And while it’s hard not to wring their necks even while that stream of BS pours from their mouths/keyboards, you can understand their frustration. How is it that a league that is the most watched in the world, generally pays the best wages and has the richest TV deal in sports relinquish a title that was almost indisputably their’s? To answer that question, I’ll turn to the world of economics. It’s no secret that — at least when looking at the league as a whole — Premier League clubs’ have greater financial resources available to them when compared to most clubs in other top leagues. And often times, most of these resources are utilized in a club’s efforts to climb the league table and compete for more lucrative places. Sometimes it’s for a higher payout or safety offered due to a higher league place, and for others it’s jostling to get into even more lucrative European places. And that fight has intensified in recent years, particularly at the top and bottom of the table. scaling the premier league heights requires more resources than it used to. Recall that just a few short years ago, the “Big Four” sides dominated both in England and Europe. Now there are as many as six of seven sides battling out for the spots that Arsenal, Chelsea, Liverpool and Manchester United practically held a monopoly on. Meanwhile at the bottom of the table, the relegation scrap has increasingly been fought in places as high as places 10-12 with just a few points separating the doomed and midtable. With so much at stake in both ends of the league, clubs are spending at increasingly higher rates to pull in increasingly better players to improve their chances of reaching whatever target they’re aiming for. Need proof of this? 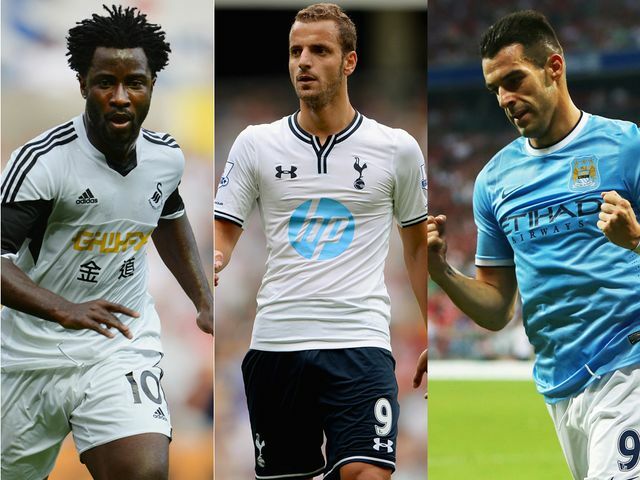 Look no further than the incredible strike force on display in the Premiership this season. There’s probably never been a time where there have been as many top quality strikers in the league. Sure the top teams are chock full of their normal premier talent: Rooney, van Persie, Chicharito, Welbeck Torres (I know), Eto’o, Ba, Sturridge, Suárez, Agüero, Negredo, Giroud, Podolski. But there’s also even more talent further down the ladder: Soldado, Lukaku, Lambert, Osvaldo, Benteke, Michu, Bony, Altidore, Fletcher, van Wolfswinkel, Hooper, Remy, Cissé. And they’re all pretty much needed by their clubs to have any realistic shot of attaining the heights they’ve set their eyes on. But despite this abundance of talent, especially at the top, no single team has skipped out to a decisive lead in the league. In fact, the table is tighter than normal at both ends. This distribution of riches has created an almost unheard of amount of parity this term. More so than ever, anybody can beat anybody. And as a result of the increased competition, the amount of effort and energy needed to eek out those all important points continues to grow. And that has a knock on effect for the top teams in the league, as that leaves less energy for competing in Europe. And while this isn’t the only reason for it, its little wonder that Great Britain’s finest are finding it more and more difficult to dominate on their travels to the continent. You could also apply this Paradox of Plenty to the rapid decline in English talent, as they’ve been crowded out by expensive imports brought in to maintain the status quo. It also make sense when applied to the drastic rise of clubs operating at losses, attempting to spend their way into relevancy against clubs with even deeper pockets. That said, it’s not all doom and gloom. For one, this paradox has helped to create a league that is top-to-bottom more interesting than it has been in year’s past. The unpredictability of the league makes every match a little bit more enticing to watch: even dour match ups like Stoke City vs West Ham could prove to be gems. But it also makes you think. Would the Premier League be the “best” if a different approach was taken? I don’t know if that’s the case, or if that’s a question that can even be answered. But one thing is for certain: I’m enjoying the plenty, and that’s all that really matters.